Belle’s was not having good luck with the animal kingdom this weekend. First there was an unfortunate incident with some fictional birds. And, then Saturday morning, my husband and I realized we had forgotten our CSA basket overnight. So Belle trotted off to the front door with her father to pick up the vegetables. “Mommy, oh look.” and “Bring your camera” were both mentioned after the door opened. The front stoop was littered with the detritus of many a happy raccoon. The fastidious little buggers had cleaned all 12 ears and left the silk, cobs and husks for us to clean up. We decided to run to the farmer’s market to pick up replacement corn. Then we came home, steamed them and topped them with Fennel bud and Mint Herbed Butter. (The adults added nanami—Japanese Chili powder with orange rind and black sesame seeds) Basically combine 5 T of soften butter with 2 young leaves of finely chopped mint and 1 full fennel flower bud also chopped. Finished with coarse sea salt. That evening, my husband wondered if she was dreaming of hunting them corn-fed raccoons; but I am fairly confident she was dream of the herbed butter that she ended up licking off her plate. I just love corn too much!! Loved the idea of adding herbs with the butter! What a wonderful way to spruce up corn on the cob! Darn those racoons! As you no know Im getting into diffent seasoning for my corn. This looks so frsh and diffrent. That corn looks great! I haven't had any corn on the cob in awhile! There is just nothing like fresh corn in the summer! Sorry about those raccoons though! Poor, Belle! So glad you got replacement corn! Your herb butter and nanami sound great with it. That looks tastier than elote. And rough week for Belle. It's not going to get any easier for her in the next few months. I love fennel - you're right about it being a wonderful herb to grow - but I'd never thought to combine it with corn. Lovely stuff. I adore fennel. We haven't been able to grow it. 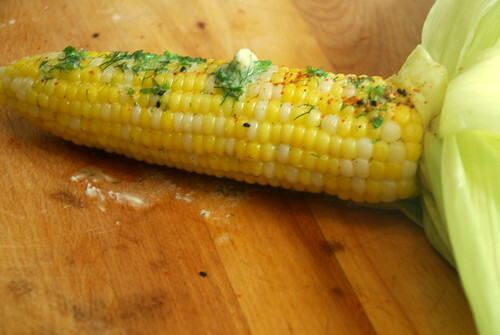 I love fennel and that corn looks delicious. Well, you've got some happy racoons, now don't you? This sounds wonderful - both versions! I think you made it up to Belle - she sounds so precious. Oh, what a fabulous accompaniment for corn. Silly racoons. Oh, those raccoons! There was one who used to come by and visit me this past year, I think he was tempted to pry the screen door open on my porch. The little guy was not afraid of anything! I'm sure they enjoyed the corn, but I know they missed out; Belle got the better deal with this fresh herbed version! Yummy. oh, fresh corn, how i eagerly await you! chakhlere: me too. Butter really works well with herbs. 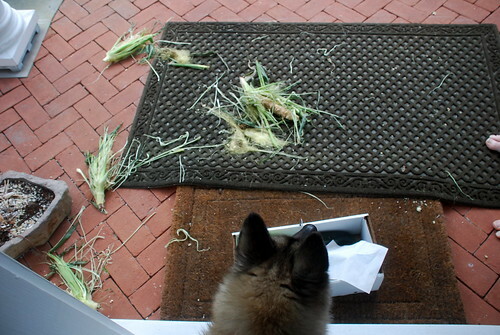 glamah16: yes, you do do great stuff with corn. meeso: get yourself some now. JennDZ - The Leftover Queen: very true-very summery. ejm: Sounds like you will need to do both. The CFT: SO TRUE. This might be one of her better weeks. Lucy: we have so much we combine it with everything. angela@spinachtiger: I am sorry to hear that and surprised. Do you have luck with other stuff? Pam: true, glass half full for them. Sophie: they are seriously fearless and a little scary. I have known many a cat who has been messed up by a racoon. Grace: revenge can be sweet. This is some gorgeous corn (what a sweet story...poor Belle) ! I love the fennel & mint flavors and of course the chile. Reminds me of the Mexican corn we so love at our house, but with a different twist. I hope I remember to try it this way next time...if only I had read this earlier as we grilled corn on the cob for dinner earlier tonight!!! Oh gosh, that looks outstanding. Fennel is one of my absolute favourites but I've never thought to pair it with corn. I must try this! Which farmer's market do you venture to?? so yummy and healthy too! That corn looks great! I love corn, but my husband isn't a fan, so I don't often cook it at home. Sorry to hear about your raccoon problem. Nice comeback, though. Mint and fennel on corn sounds so summery. 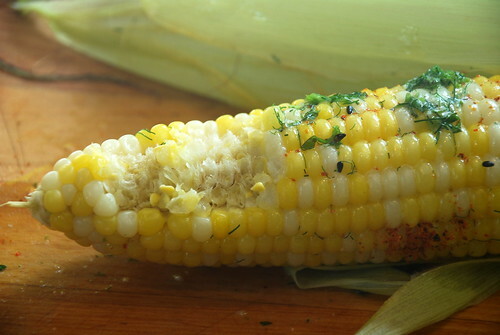 How delicious to add fennel and mint butter to the corn on a cob - excellent idea! The corn recipe and story are both great! Best of luck with your delivery! Can you believe I spent the first 19 years of my life not liking corn? I'm embarrassed to even type that. This looks delicious, I can imagine the fennel and sweet corn going great together.